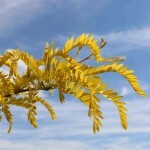 An irregular, spreading tree selected for the golden-yellow new foliage. The leaves gradually change to bright green, then back to yellow again in the fall. It is a fruitless selection. It is tolerant of drought, salt, high pH, and urban conditions. It produces a light, dappled shade.